This action provides an interface to the Windows Help Compiler. Note that to use this action, you should first set the WinHelp compiler location in the Options dialog. Bitmap Path : The search path for bitmaps referenced in the help project. Separate entries with a semi-colon. 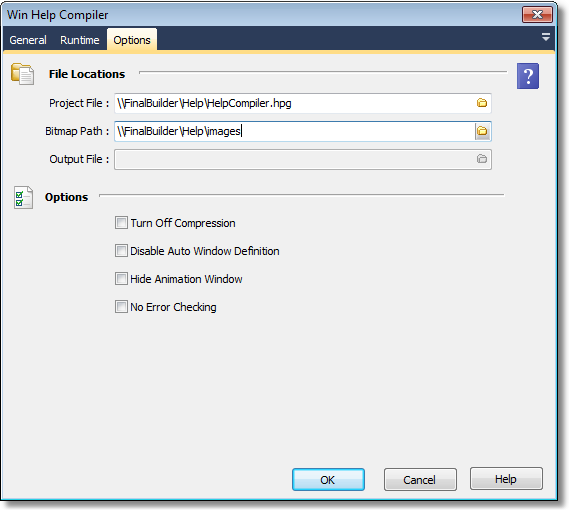 Turn Off Compression : Instructs the compiler not to compress the help file. Disable Auto Window Definition : Prevents the automatic Creation of window definition, if a window specified in a hotspot or macro was not defined in the project file. No Error Checking : Specifies that there are no errors in the rtf files. Some error checking will be turned off to speed up the compilation process. This option should only be used where compilation speed is crucial. Output File : Specifies the name of the hlp file to create. Use this only when not compiling an hpj file.